The intervention of scholars and intellectuals is a priority need more than the functions of politicians in overcoming the economic and social challenges facing the country, President Maithripala Sirisena said. 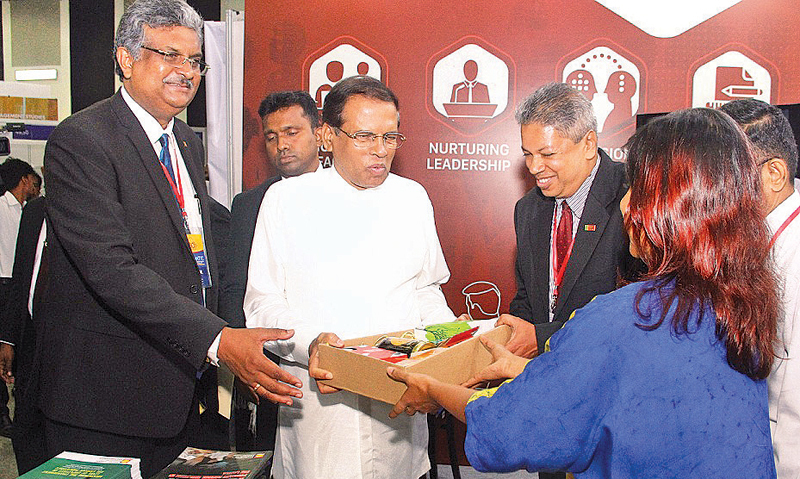 "As such, a collective of scholars and intellectuals is required by the country to overcome challenges facing the nation," the President said, when he opened the “Innovate Sri Lanka 2019’ Exhibition at the BMICH Colombo yesterday. The Exhibition organised by the University Council for innovation, intervention and venture creation to mark the 60th anniversary of the Sri Jayewardenepura University will continue today (April 3). A press release by the President's Media Unit said the Sri Jayewardenepura University is making an active contribution towards planning new creations and conducting research in various fields and the 'Innovate Sri Lanka 2019' has been organised by collecting new innovations and creations covering various fields. The President also undertook an inspection tour of the exhibition booths after the opening ceremony. Sri Jayewardenepura University Vice Chancellor Prof. Sampath Amaratunge, a large number of Professors and Lecturers and Vidyajothi Dr. Bandula Wije, an International Ambassador in the field of science, technology and innovation were also present on the occasion.